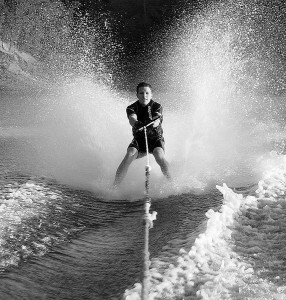 Many June SAT test-takers can take a day off from waterskiing this summer to retake the exam. So why can’t College Board offer a retest this summer? After all, they made a big blunder on the June exam! It’s the right thing to do. This week has not been the first week that we at Ivy Coach have been critical of College Board. Let’s just say that College Board knows us well. Remember a couple of years ago when the College Board sent out cow stickers? We sure do. Well, we’ve got some more to say about the printing error on the June administration of the SAT. For those who don’t read our college admissions blog every day as they eat their waffles and down glasses of freshly squeezed orange juice, there was a printing error on the June test and College Board ended up having to discard two sections of the exam. The testing company insists they will still be able to score the exam but many students and parents are up in arms. One Long Island student even filed a legal claim against the company. College Board previously issued a statement that they would allow test-takers to take the October administration of the SAT as a makeup at no additional cost. Right. That’s like when Ironman canceled a race in Lake Tahoe, California at the very last minute with swimmers all in the water only to then charge the swimmers more to enter that same race the subsequent year. It’s not like we speak from personal experience. Ok, we sure do. Anyhow, we asserted that such a response on the part of College Board was unacceptable. For many test-takers, it’s not about the fee. It’s about the fact that they studied and prepared for this exam in June. And now they have to wait through the rest of June, July, August, September, and part of October to sit and take the next test? It’s particularly unfortunate for students who intend to apply Early Decision or Early Action because they need to know their scores with expedience as their scores will likely influence where they choose to apply. Finding out a score so late in the game is far from ideal. And so we, along with other organizations like FairTest and other folks in the college admissions community, urged the College Board to not only waive the fee but to administer the exam over the summer months, so these students can re-take the test if they so choose while still fully prepared. College Board, it’s time to make a true, genuine concession and that concession is to offer the exam over the summer months. You’re a big company. You’re capable of doing it. We know it. Enough with the piecemeal responses, as Griesemer suggests. It’s time to take some real, appropriate action. It’s time to do right by your June test-takers. You owe it to them. You can do this. You can. Many students plan the SAT around extra-curriculars. A student that has demanding athletic commitments in the fall might carefully schedule their test-taking to avoid overload. The College Board waiving the fee does nothing to help the student that has a conflict.